So here it is, my very first blog. I have to confess I'm not the most competent person when it comes to IT so this blog has finally come together after some serious effort. I have stared at my computer for some time and almost cried trying to set up this site. All I want to do is write a blog, how hard can it be?! Well, very hard it turned out. For me anyway... But, with some help from some awesome people (mainly you Vin) it's finally here, hurrah! I've been thinking for far too long that I should do a beauty blog not only because I love make-up but because I used to love writing. 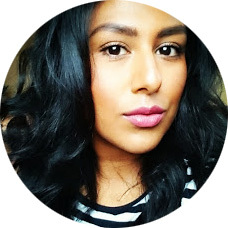 So I'm combining the two great loves of my life to bring what I hope is going to be an interesting, helpful, funny, insightful, charming and sometimes inspiring blog on make up, skincare, beauty, fashion and life. So hello to whoever is reading this. I am Rina. I like taking pictures, tattoos, baking, triangles, New York City, New Girl, Cece from New Girl, men with beards, books, kooky new age stuff, scented candles and my loft bedroom which is like my secret sanctuary.